Henry Kulky's bio as prepared and written by the powers-that-be within 20th Century Fox. This bio is taken from Voyage's syndication package issued in 1968 upon the original entry of Voyage to the Bottom of the Sea into the syndication marketplace. Henry Kulky played Chief Curly Jones during Voyage's first season until his untimely death of natural causes. Mike's VTTBOTS Zone salutes Henry Kulky!!! He was a great chief of the boat. A veteran of more than 500 appearances in motion pictures and television, character actor Henry Kulky never had an acting lesson. His grounding in drama is credited to his 7000 performances as Bomber Kulkavich, wrestler. Kulky made his first move into the ring in his native town of Hastings-on-the-Hudson while in his teens. He began as a boxer, but had fought only six bouts when he was offered the job of teaching wrestling at St. Matthew Lyceum in Hastings. In 1939 he was whisked off to Argentina by wrestling promoter Stanislau Zbysko. Kulky won 172 matches while losing only three. He also won the South American judo crown. Back in the United States, Kulky shot quickly to the top ranks of the wrestling dodge. Engaging in as many as eight bouts a week, he went to the mat with such greats as Duseks, Lou Thesz, Yvon Roberts, Larry Maquin, The French Angel and the one-time heavyweight boxing champion, Primo Camera. His career was interrupted by wartime duty in the Navy as a boatswains mate on Atlantic patrol duty. In 1946, Kulky came to California to wrestle, where his friendship with wrestler-turned-actor Mike Mazurki resulted in a role in "Call Northside 777" with James Stewart. Other movie offers followed and by 1950, "Bomber" hung up his wrestling trunks for good, grateful that he was the only big-time wrestler who had never acquired the badge of his trade--cauliflower ears. 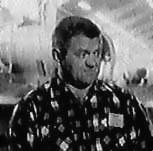 In 1949, Kulky made his television debut on "The Life of Riley," in which he appeared for five years as Otto, Riley's co-worker. Concurrently, his movie career continued, with roles in "The Robe," "A Star is Born," "Fireman Save My Child," "Up Periscope," "Hell and High Water" and others. Following "The Life of Riley" series, Kulky kept busy in motion pictures and television, and for three years played a Navy chief cook in Jackie Cooper's "Hennesey" series. His most recent motion picture role was in Bob Hope's "A Global Affair."